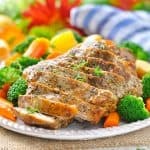 This slow cooker pork and vegetables couldn't be easier to make, with just 10 minutes prep work you'll have a delicious, hearty and satisfying meal to feed the whole family. Place carrots, potatoes, and onions in the bottom of a large slow cooker. Sprinkle Italian seasoning, garlic and salt over the vegetables and toss to coat. Place pork on top of the vegetables. Add lemon to the slow cooker and pour chicken broth over everything. I don’t think that broccoli cooks well in the slow cooker because it gets mushy. Instead, I prefer to steam my broccoli separately so that it’s just crisp-tender, and then stir it into the pot at the end of the cooking time. As an alternative, you can stir the raw broccoli into the slow cooker during the final 1 hour of cooking time so that it has an opportunity to cook with the rest of the dish, but it doesn’t become overcooked. Slice pork loin just before serving.